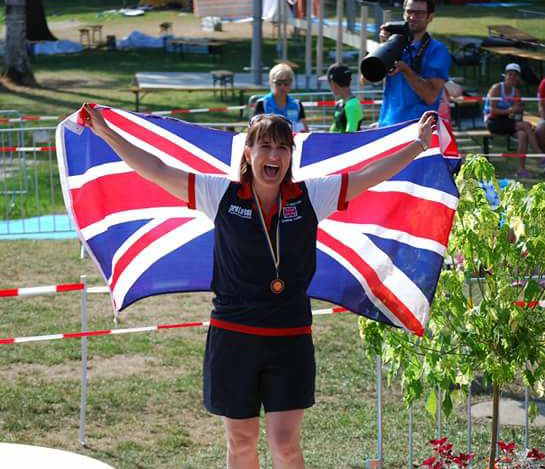 Gemma competed for Great Britain in the Biathle and Triathle Europeans coming 5th senior woman in the Biathle and 9th in Triathle and also came 3rd in the mixed team Biathle relay. 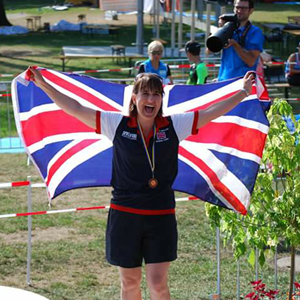 Gemma is the British Biathle and Triathle Senior Woman Champion for 2018 and qualified for the London Marathon with a time of 3 hours 28 minutes in Birmingham 2017 – she unfortunately had to turn down this opportunity to focus on Biathle/Triathle. In 2018 Gemma was a key player in the Basingstoke ladies 1s team who finished one place short of qualifying for the National League. Gemma also trialled for the England Vets team in her age group at the end of the hockey season and was selected for the squad that represented England at the EXIN Masters World Cup tournament in the summer. She contributed to team performances throughout the tournament including an appearance in the Gold Medal match where England won the game to become World Champions. Charlotte achieved her goal of qualifying for the Senior Hampshire team to compete in the UK Inter Counties Cross Country Championship, where she finished 3rd for Hampshire. This meant she has been selected, and competed, for Hampshire in every age group in this event. Charlotte ran a sub 38 minute 10k and ran 36:33 at the Vitality 10k in May 2018, along with a PB in Park Run. In the UK Inter Counties Cross Country Championships she exceed her goal of finishing in the top 80 (78th) in the senior race. 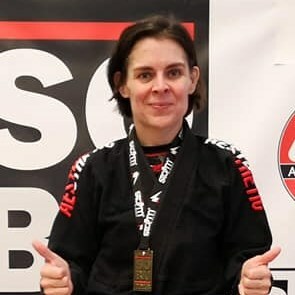 During 2018, Jennifer competed in the UK National Series and achieved a British ranking. She was also selected for the UK Team at the Invictus Games in Sydney where she won 2 medals. She then went on to compete in the World Indoor Archery Series in Luxembourg where she finished 17th against a world class field that included world record holders and Olympic competitors. Goals for 2019 include competing at a higher level within the UK and improving her British ranking. Cat’s highest personal achievement for 2018 was to be part of the GB Triathle team and compete in Germany, where the level of competition was much more intense than the previous year. 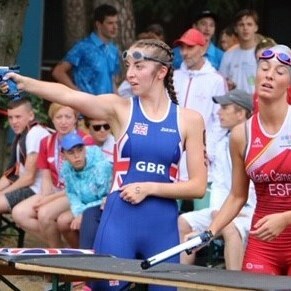 She achieved a podium place, coming 3rd individually, and 2nd as part of the GB Mixed Relay. Cat’s efforts in the National Biathle World qualifier at Salford Quays meant she was offered a place on the GB team for the Biathle World Champs in Egypt, along with a place on the GB team for the World Champs for the new Laser Run competition, in Dublin and she concluded the season by coming 3rd at the British Biathlon Champs. Mair is a talented and dedicated athlete who represented her country, as part of Team GB Juniors, 3 times in 2018 and achieved a bronze medal at the World Juniors in the 4x100 relay. She has been the county champion at 100m since 2015 and 200m in 2014, 2015, 2016 and 2018 and has now won a full scholarship to study and compete for Eastern Michigan University, but her heart is still in Basingstoke! Liz Is ranked #1 in the world for Ladies vets +65kg Light contact category and #3rd in the world in the Ladies vets -65kg light contact category. She is also ranked #5th in Ladies vets Points +65kg and #9th in Ladies -65kg category. In 2018, Liz won Gold and silver medals at the Hungarian world cup and in Budapest she was selected to represent GB in the points and light continuous sections of the European. 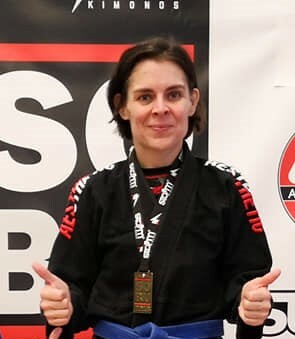 Liz also won 2x WAKO British Championships Light con divisions and, despite missing the last two Cimac superleague tournaments, Liz won the grand championships for the +65kg light contact division. Samantha’s biggest personal achievement for 2018 was being selected for the Oceanman World championships and getting the opportunity to swim out in Dubai. There was a total of 709 females she competing against over a distance of 5kilometres - the race was held in the sea and Samantha completed it in just over one hour, finishing 1st in her age group, 1st overall in females and 7th out of 1500 people both men and women. Samantha has now automatically qualified for the finals in Malaysia in 2019. 2018 saw Jitka become National Champion, All Stars Champion, English Champion, as well as London Cup and Bournemouth silver medallist. Jitka always conducts herself with honour at any competition she goes to and is a great role model within her school. She is her schools oldest female competitor and has inspired many of the younger women and men to compete. Jitka has also been a great inspiration for the community by being one of the major contributors in raising £1500 for St Michaels Hospice. Bronze medal at British Triathlon Championships early in 2018 and in September represented Great Britain at the ITU World Championships in Australia on the Gold Coast finishing 7th out of 73 competitors. Also competed in the Texas Ironman and Ibiza Mulisport Aquathon. Tracey had regular high placings at National open competitions throughout last year including the ITU World qualifier and has achieved visible benefits from her Aquadrome scholarship. In 2018, Charlotte was selected for the GB Target Sprint after trials, achieving a time of 5 mins 50 seconds, well below the minimum consideration time of 7 mins. Her race times have steadily improved during the year, culminating in a personal best time of 5 minutes 34 seconds, when she won her individual bronze medal. 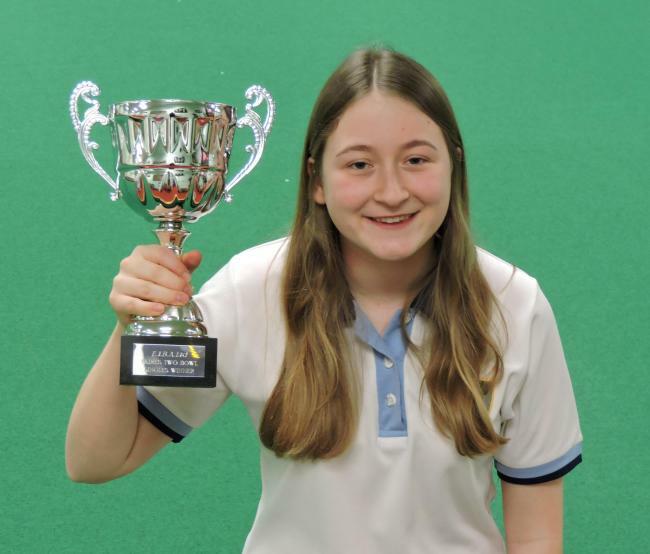 In addition to medals won in 2018, Charlotte also achieved a British Shooting award: ISSF Major Medallist 2018. Charlotte currently coaches the Baughurst Scouts shooting team and they have been very inspired by her hard work, training and success. Leo is a senior international fencer competing on the Canadian National Team and is also an Olympian. 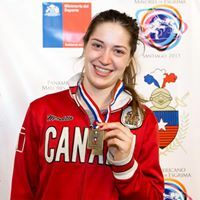 She is training to qualify for Tokyo 2020 Olympics and the Lima 2019 PanAmerican Games Leonora is currently ranked number 1 in both the UK and Canada and 57 in the World and, in 2018, she had one of her most successful seasons so far finishing 12th in the Dubai World Cup, top 32 at the Barcelona and Havana World Cups and the Cali Grand Prix and also in the top 64 at the Budapest Grand Prix. Sarah’s goal for 2018 was to represent her country, which she duly achieved. She was selected as Vice-Captain of the England over 55 Masters Hockey team. During August the Masters Hockey World Cup was held in Terrassa, Spain and England made it through to the final beating Australia in the final on penalty shuffles. Sarah continues to play hockey at Basingstoke Hockey Club where she is an inspiration to all. Katie achieved 5th and a 6th place at Ghent international regatta in women’s 8+ respectively along with a 6th place at the British Rowing National Championships in the Women’s eight. After spending the early part of this year injured, Katie continued working hard over the summer and won a seat in the first eight, coming back to training in September with the most competitive Brookes Women’s squad there has ever been. 2018 was probably Fleur’s most successful year in terms of times for each event and National Titles; winning 50, 100 and 200 Free at Short Course Nationals all in lifetime bests and she also achieved six County Records. She won 3 more titles and her first 50 Fly National title at Long Course Nationals, again in best times. Fleur narrowly missed the British Record 1 minute barrier for 100 Free by 0.18, again achieving a lifetime PB. A hugely successful 2018, saw Nicole end the year being crowned World Ladies under 25 Champion whilst representing England. 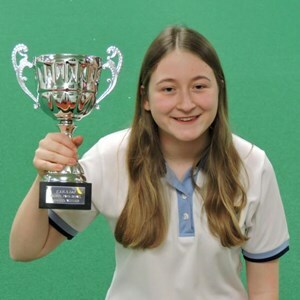 Throughout the year, she also won the National Indoor 2 wood Singles title, represented England at junior level both indoors and outdoors and was called up for a senior indoor trial. Nicole is extremely dedicated and is an excellent ambassador for the sport of Bowls. Goals for 2019 include breaking into the top 4 in the European Ladies ranking and qualifying for the World Senior Championships. Jessica spent 2018 balancing study and sports performance to ensure achieving sufficient grades to attend the National Training Centre in Bath to train and study in 2018/19. 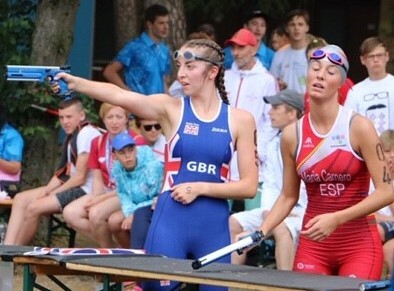 She is ranked a top 6 athlete by Modern Pentathlon GB, and also obtained her Junior Riding certificate. Open International competitions included Laser World Champions in South. 5th individual and relay, and the Irish National Tetrathlon, 3rd.